What a fun treat these healthy little bees are. Made with honey and peanut butter, and striped with chocolate, these sweets are truly the bee's knees. 1 Combine the peanut butter, butter, honey, and crushed crisped rice cereal in a bowl and stir with a wooden spoon until well mixed. 2 Shape teaspoonfuls of the mixture into balls and chill them until firm. 3 Measure the chocolate chips into a microwavable bowl and heat them in the microwave for 15-second intervals, until they are melted (note: they won't lose their shape). Stir the chocolate with a wooden spoon until smooth. 4 Drizzle chocolate stripes over the honey balls. 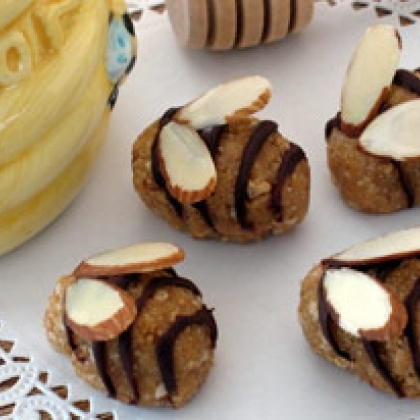 5 For bee wings, set two almond slivers on top of each honey ball, using a dab of chocolate to secure them and fanning them toward the sides just a bit. Makes about 2 dozen.